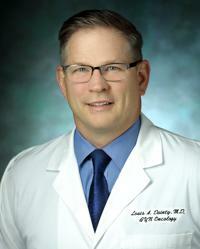 Louis Dainty, MD, is Regional Director of Gynecologic Oncology at Georgetown Lombardi Comprehensive Cancer Center and Chief of Gynecologic Oncology Department at MedStar Washington Hospital Center. He is board certified in obstetrics and gynecology, gynecologic oncology, hospice and palliative medicine, and forms part of the Quality Control Committee at MedStar Washington. As a gynecological oncologist, Dr. Dainty specializes in the treatment of all gynecological malignancies, including ovarian, uterine, and cervical cancer, as well as large uterine fibroids or pelvic masses. To treat patients with these conditions, he uses surgical techniques such as robotic-assisted, laparoscopic, and laparotomy, or open surgery. He is a member of the Society for Gynecologic Oncologists Education Committee and participates in the editorial review of Military Medicine, the journal of the Association of Military Surgeons of the United States. Dr. Dainty is also heavily involved in the education of medical students and currently participates in the education of fellows, residents, and medical students enrolled in the MedStar Georgetown/Washington Hospital Center Residency Program. Health Sciences before completing a four-year residency in obstetrics and gynecology at the Madigan Army Medical Center. He then joined the Walter Reed Army Medical Center for a three-year specialty fellowship in gynecologic oncology. Following his professional training, Dr. Dainty received a Masters in Business Administration with a focus in healthcare management at Pacific Lutheran University, where he also participated in a faculty development fellowship. Passionate about providing patients within the MedStar organization access to clinical trials, Dr. Dainty promotes clinical trials at the Comprehensive Cancer Center at Georgetown and any affiliated hospital or care center. He’s dedicated to developing a cohesive approach to gynecologic oncology care across all MedStar facilities that provides patients a collaborative team of providers, as well as a comprehensive approach to care that makes it possible to receive more referral patients from the region. He strongly believes in the use of palliative care and starting it early on in treatment, in order to maintain the patient’s quality of life long-term. Dr. Dainty is widely published and has presented nationally on numerous occasions. “My priority is to have the ability to give equal access to care to patients in the Washington, DC, region. I form very special relationships with my patients, and it is important to me that they feel taken care of. Our staff at MedStar is known for treating patients like family, with warmth, kindness, and compassion. We remain by each patient’s side throughout the entire process, including long-term follow-up care.